I woke up at 4:11 this morning with a death-like worry. 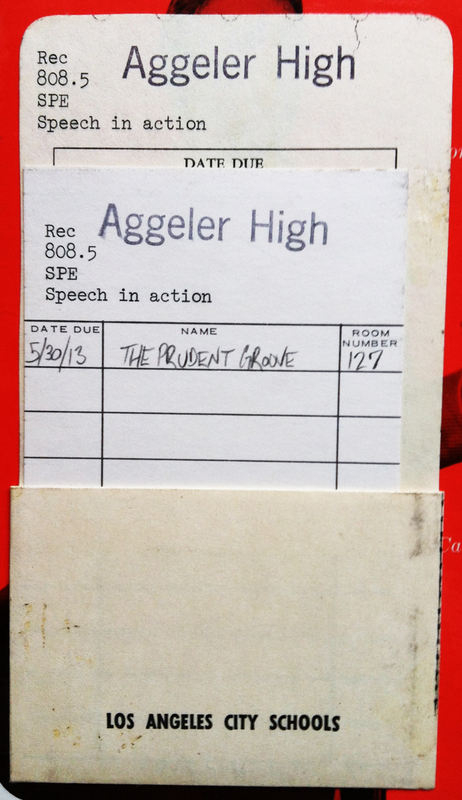 I was afraid I’d neglected to return the Speech in Action record to the Aggeler High library. So, half-dazed and fully panicked, I threw on the lights and checked the “educational section” of my library. Through tears and a palpitating heart, I discovered that yes; it was due, but thankfully, not until 3pm today. Speech in Action is exactly what it sounds like: Examples of people speaking with different inflections pertaining to their different points of motivation. 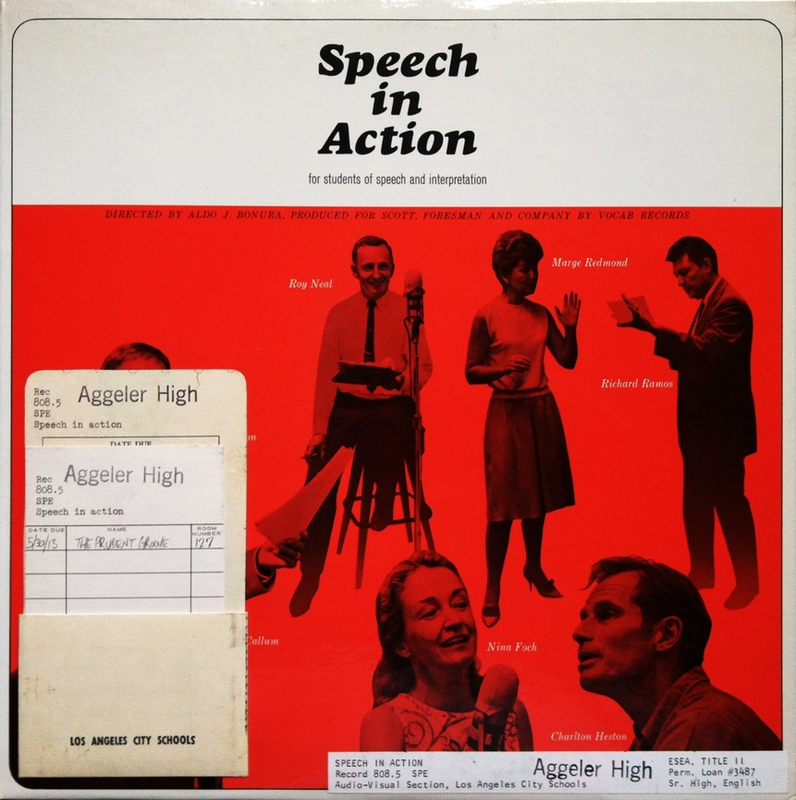 John Callaway, the narrator, gives a brief description to each of the 10 types of speech and interpretation, after which an example of each is performed by some of topnotch vocal chords 1965 has ever heard (Roy Neal and Charlton Heston to name a few). For many of us, casual conversation at the office (usually about Nutella or the social need for foot deodorant) is something that comes naturally, and rarely requires much preparation. This is “speech to inform.” I would have had no Earthly idea that my early morning rants on what constitutes a “good” cup of coffee were actually mundane, yet surprisingly engaging “speeches to inform” had it not been for these beacons of educational, and applicable grooves. I never thought I’d say this, but thank you, Mr. Heston. 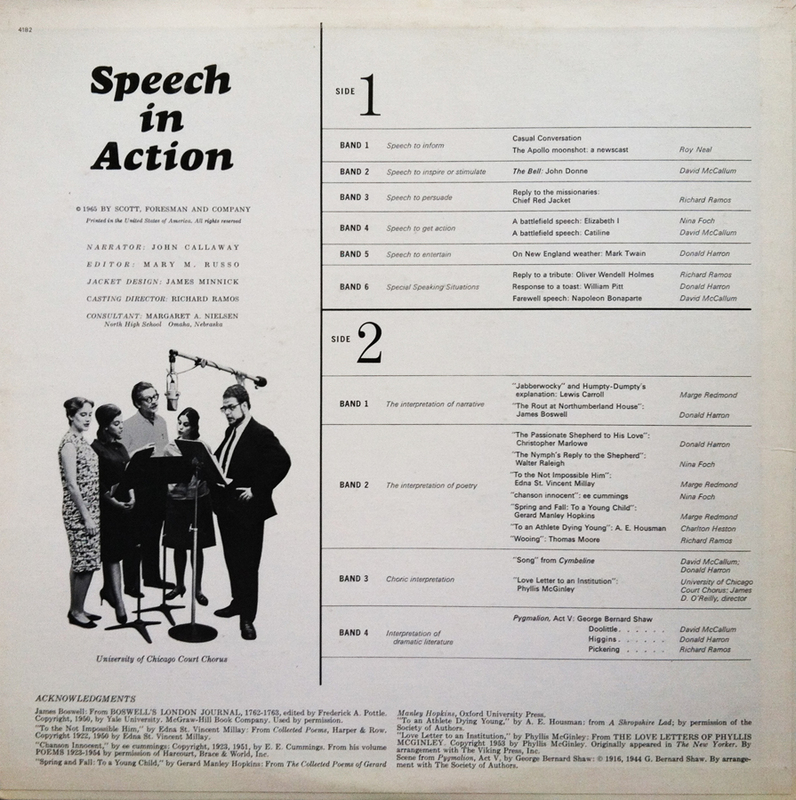 If you’re stuck giving a speech at your next VFW luncheon, or you foresee an upcoming monologue directed towards your girlfriend’s father in the last-ditch attempts to persuade him that his daughter need not stay in that night, try Speech in Action. You’ll gain confidence, stature, and Godlike wisdom. Check it out. That is, if I actually remember to return it.